Even with computers in school, children still write papers, complete math assignments and take notes by hand. If you notice your child struggles to complete handwritten assignments, take steps to help her increase her speed. There are several causes for slow handwriting, including learning disabilities. McMaster University's Handwriting Assessment Protocol explains that hand fatigue, poor posture, immature pencil grasp, incorrect paper positioning and bad habits also contribute to slow handwriting. Do drills to reinforce correct letter formation and exercises that improve your child's positioning, dexterity and hand strength to increase her speed. Make an appointment with your child's teacher and discuss the problem. 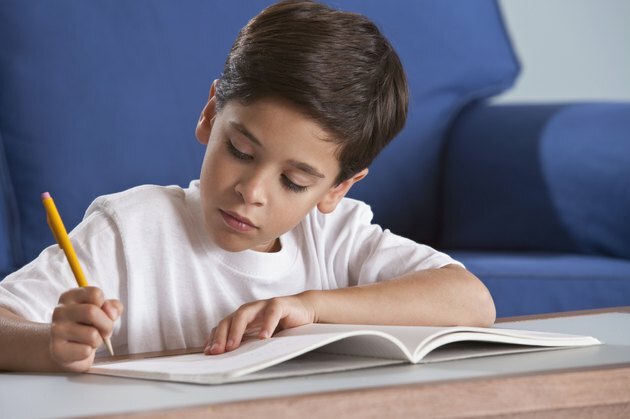 Children that struggle with handwriting speed and formation of letters may become frustrated and lose motivation to learn. Ask to see your child's papers and request the teacher help you pinpoint where the problem lies. Ask her about your child's pencil grip and whether your child is forming and writing the letters properly, from left to right. Observe how your child holds the pencil and forms his letters. Put a soft plastic pencil grip on the end of his pencil to guide his fingers in the proper position, if necessary. Set a piece of paper at a slight angle in front of him. Give him a cursive or manuscript alphabet chart. Ask him to copy the chart. Watch him form each letter and make a list of those letters he forms incorrectly. For example, make sure he is writing manuscript, lowercase "a," in one stroke -- drawing a circle toward the left and completing the letter with a line straight down the right side of the circle. Pick several letters every day and have him practice writing the letters correctly and smoothly. Incorporate a variety of sensory systems when helping your child with handwriting. Let your child write on grid paper to help her keep her letters a consistent size and use a stopwatch to challenge her to complete one line of writing in a certain period of time. Watch her closely and encourage her to stay focused and work quickly. Allow your child to perform a variety of writing activities. Practice daily letter drills, but keep that short and focused. Give your child a journal and ask him to write for 3 to 5 minutes. Let him copy a paragraph from a book or pick his own topic. Tell him not to worry about spelling, but just focus on his handwriting speed. Help him concentrate by keeping the area quiet. If he likes to sing, encourage him to make up songs and write them down. Use putty to develop your child's finger grip. Improve her finger dexterity and fine motor skills by giving her tweezers, placing small objects in the palm of your child's hand and asking her to use the tweezers to move the objects to the table without using her other hand. This helps strengthen her hand muscles to keep her from writing slowly due to muscle pain and hand fatigue. PBS: Misunderstood Minds: Writing: Where Do I Begin?